Kuala Lumpur - The most anticipating Korean Lifestyle Road Show 2017 is returning with its 3rd Edition. This year, it will be held at Ground Central Floor, Berjaya Times Square on 22nd to 23rd April 2017 from 10AM to 10PM. 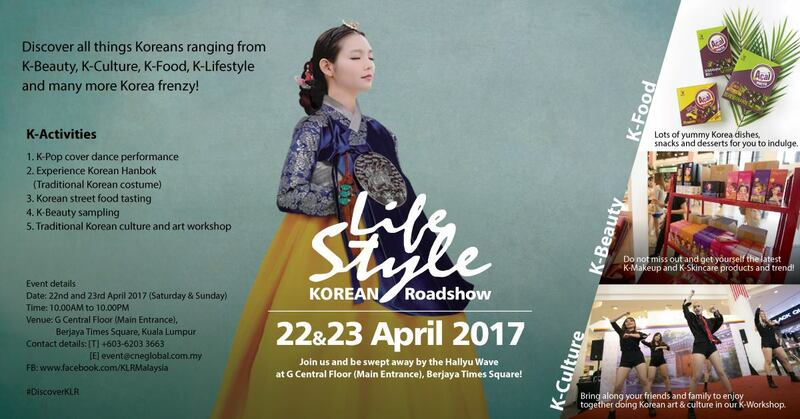 The 2-Days event will be showcasing the K-Beauty, K-Culture, K-Food and K-Lifestyle with the theme "All Things Korean" specially for YOU, Hallyu fans! Visitor will receive goodies bag with your all time favourite Korean products which sponsored by Tony Moly, Karmart, Acai Preto, Kioda and Miseoul. So don't miss the chance to indulge yourself with All Things in Korean!